I gaze up at Tasmanian artist Bobby-z´s tribute to the people of the mines HERE: then look past it to the conical hill that for over 460 years, has given humanity so much, and yet taken so much away. Millions of Andean Indians were swallowed by ´´the Mountain that eats men alive´´. Hollow, but still standing at 4,860m above sea level, she has not once slept during this time. She is tired, but not exhausted. Today´s dust-coated miners continue to work like ants, extracting minerals from the man made arteries of their giant nest. Miners and their families continue living in poverty and dying at an alarming rate. 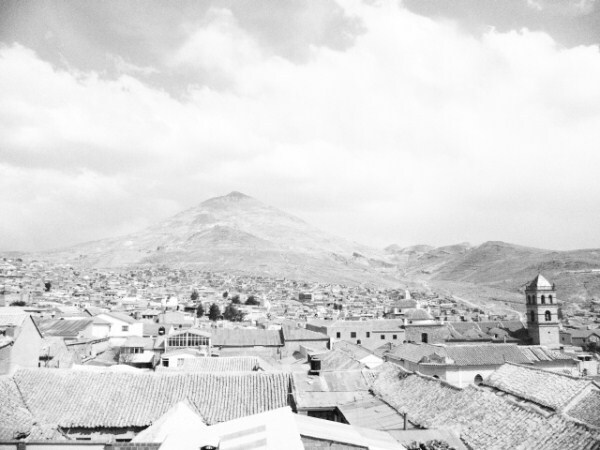 This hill has shaped Potosí and its society, but its story also defines the post-Columbus history of Latin America, and indeed, the cruel relationship between rich and poor, the world over. ´´It never stops speaking,´´ she responds. 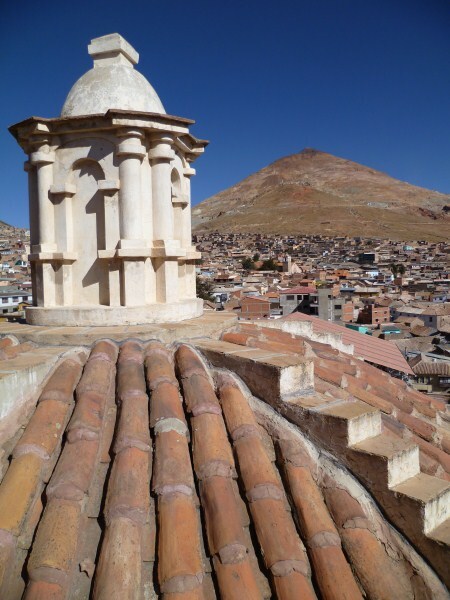 The story begins over 500 years ago, on the high plane of what is today, Southern Bolivia. The Incas knew of the conical hill nestled between mountains, they called it Sumaj Orko, or handsome mountain. Upon seeing it in 1462, Incan leader Huayna Cápaj, was stunned by its colour and form, and suspected it may contain precious stone or metals. Although precious metals were not used commercially by the Incas, they were of vital importance to their worship of gods. When his miners began to pick at the hill a great voice speaking in Quechua bellowed from below, ´´This is not for you; God is keeping these riches for those who come from afar.´´ As they fled in terror, the Inca changed the mountain´s name to Potojsi, which means, to thunder or explode. A few years later in 1545, an Indian named Huallpa, spent a cold night on the hill in search of an escaped llama. By the flickering light of his fire, he saw a vein of pure silver flashing in the night. Within no time, the Spanish, who had conquered the region a few years earlier, had learnt of the find, renamed the peak Cerro Rico (Rich Hill) and enslaved thousands of Indians to extract the silver. This was the beginning of the mass genocide, through labour servitude, of the Andean Indian. Potosí was then part of the Viceroyalty of Peru as Bolivia was not yet in existence. The ´mud faced peoples´ who worked in the mines were brought from the entire Andean region (parts of today´s Bolivia, Peru, Argentina, Chile) and beyond. In three centuries, Potosí´s Cerro Rico took the lives of eight million Indians, almost today´s population of Bolivia. That´s 73 lives a day, every day, for three hundred years, lost on one mountain. Much of the silver was used to create luxury items such as hand bags, cigarette boxes, silver dinner services, and even bed pans for Europe´s wealthy minority. Each silver trinket or ornament would have been worth more than an indigenous family could hope to make in a lifetime. 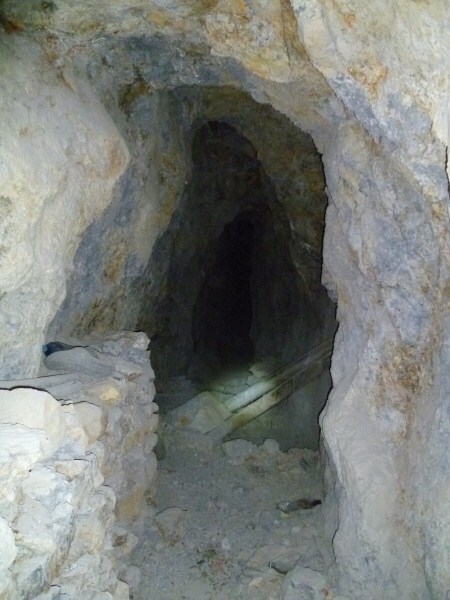 Thousands of slaves from Africa were also brought to the mines of Potosí, but they were not considered as useful because they were too big for the tiny tunnels, and generally didn´t survive the cold climate and high altitude. 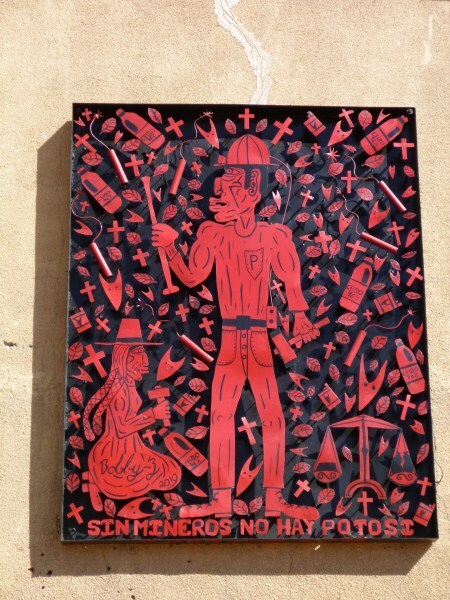 The indigenous Andeans enslaved in the mines were referred to as mitayos because they were required to pay a mita, which was a tribute to the Spanish Crown. It was generally paid in the form of forced labour. These men, women and children, taken from their agricultural communities hundreds of kilometres away to work in the mines, were divided up along with land that was given as royal grants, or were rounded up by expeditions of Spanish soldiers. Many perished en route, and those that did make it to the mines survived, on average, between four to seven years. Those unable to work due to accidents or ill-health were dumped or slaughtered. In 1550, Dominican monk Domingo de Santo Tomás described Cerro Rico as the ´´mouth of hell´´ that swallowed Indians by the thousands every year. The mitayos hacked out the metal with picks and carried it out on their shoulders by candle light. Outside they would grind and wash it, propel the heavy wooden shafts of the mill and melt the silver over small fires. Around 6000 fires, taking advantage of the night breeze, would burn on the hill every night. The smoke from the fires meant no crops would grow for a radius of close to forty kilometres, and was no more generous to the bodies of the workers. Mercury used to extract the silver poisoned as many of the Indians as did the toxic gases within the mines. By 1573, the census showed that Potosí had 120,000 inhabitants, making it as big as London and bigger than Madrid, Paris and Rome. It was one of the world´s biggest and richest cities. By the mid seventeenth century, silver constituted 99 per cent of all mineral exports from Spanish America. Latin America was a huge mine, with Potosí its centre. Fifty per cent of all silver from Latin America came from Potosí. Potosí had the world´s largest mint, producing the currency for many countries. Coins from Potosí were a stable global currency, like today´s US Dollar or Euro. They were 93 per cent silver, the value being not just the coin, but the silver. Today, Bolivia lacks access to technology, has no working mint and has to have its currency made in other countries. Eduardo Galeano wrote, ´´The sword and the cross marched together´´ in the pillage of Latin America, and nowhere more so than in Potosí. By 1692, 28 churches had been built. Today, the city is still graced by many of these elaborate and elegant colonial churches. Another type of church, such as Iglesia San Benito, was also built, simple yet large, made from cheap materials, and located in the lower part of the city where the Indians and African slaves lived, separated by a river from the grandeur and extravagance of the ruling class. These churches were built both to convert the indigenous slaves to Catholicism, and to collect the mita, of which the Church received a healthy share. In 1581, Phillip II of Spain told an audience that a third of Latin America´s Indians had already been wiped out and, referring to Potosí specifically, that mothers killed their own children to save them from the horrors of the mines. Yet the Crown continued to collect a fifth of the value of all minerals extracted, as well as other taxes, and only ceased the destruction of this land and its people in 1825, when, partly thanks to Napoleon attacking Spain, independence was finally won in the Andes. 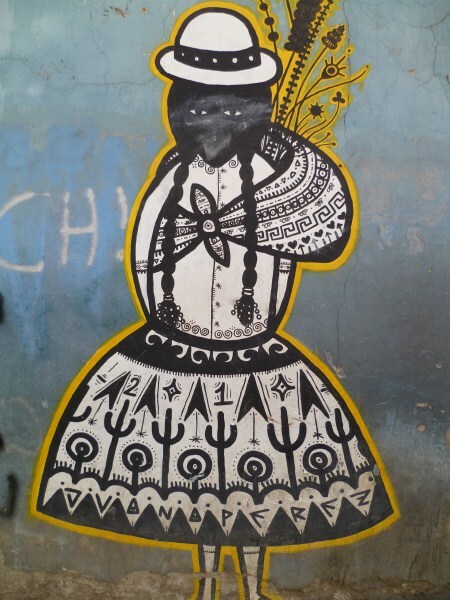 Potosí has a revolutionary past and present. It has been central to the South American struggle for independence from Spain and indigenous empowerment. 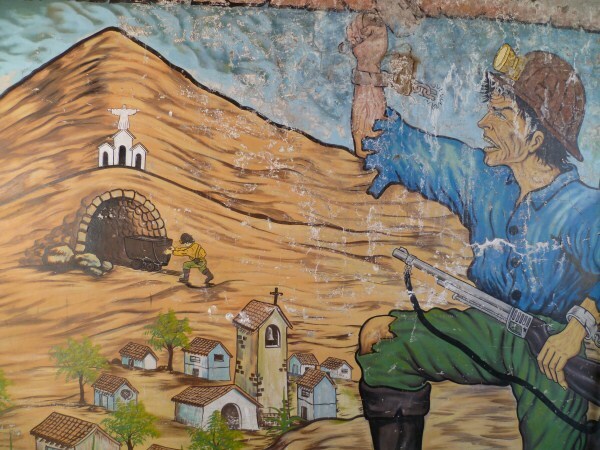 The first major revolutionary moment, in what is now Bolivia, was in 1780, when Indian peasant Tomas Katari led a regional insurgency in Potosí that set off a chain of events pushing for indigenous liberation that spread as far as Cuzco, in what is now Peru. After about a year and having taken control of all but a few major cities, the indigenous army of around 80,000 were finally destroyed by Royalist armies sent from Lima and Buenos Aires. Having liberated his native Venezuela and other regions through the Andes, Simón Bolivar finally freed the altiplano region that would be named after him. Bolívar created Bolivia and became the new country´s first president. His initial decrees in 1825 abolished the mita, personal services to local notables and sought to dissolve the use of indigenous as a corporate entity (at this time if you owned land you also owned the Indians on it). But they would not be granted the rights of citizens, as ´democracy´ was coming, and Indians were the clear majority. Soon after independence, the decrees were repealed anyway. Independence changed little for those working inside Cerro Rico. It merely weakened external colonialism in favour of the internal colonialism to which it had given birth and, which was still based on a racial hierarchy. Indian tribute continued until the 1880s and it wasn´t until the start of the 20th century that a subsistence wage began to emerge. ´´There have to be schools. We have to stop being slaves. After silver effectively ran out in the 1890s, Bolivia depended almost entirely on the tin left behind by the Spanish, making it highly susceptible to shocks in the global market. The price of tin collapsed in 1929, and though the tin-mining elite (known as La Rosca) suffered little, the working class and peasantry were devastated. 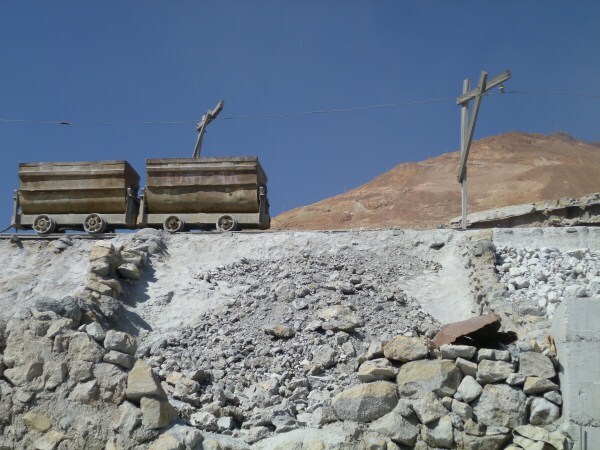 Extreme poverty led to the uprising of Bolivia´s tin miners with calls of, ´´mines to the state, land to the people´´. In 1952 they overthrew a military regime and won nationalisation of the large mines under workers’ co-management. Units of the army were even dismantled and replaced, in some mining communities, by miners’ militias. When the US flooded the market in 1985, the world price of tin collapsed again, plummeting to less than half of what it cost Bolivia to mine it. 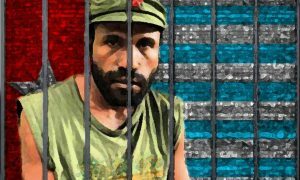 The same year saw the end of Bolivia´s revolutionary government. By the end of 1986 about 70 per cent of the 27,600 miners employed by the state mining company COMIBOL had been made redundant as mines shut down. The response to the crisis by the new government devastated the poor in a way that is all too familiar in the Third World. The package pushed by the IMF and the World Bank, froze wages, raised taxes, freed prices and promoted foreign investment. 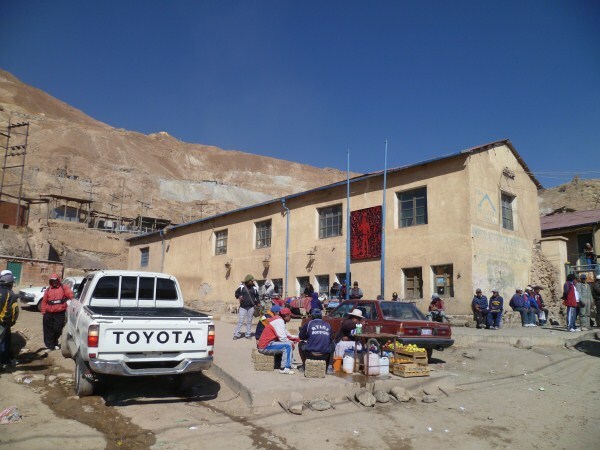 The period saw incredible poverty in Potosí once again. 81 year old Celestina and her 62 year old daughter Maria work with 68 year old Macaria, breaking and separating the poor quality rock by hand on the side of Cerro Rico, for around four dollars a day. Macaria is there because neither her husband, who was left brain damaged after a mining accident, nor her daughter, who doesn´t have any legs, can work. As we sit looking over the previously government owned miners´ houses, which are now mostly empty, the women all lament that conditions were much better before the crash and subsequent re-privatisation. Bolivia is Latin America´s most indigenous country. Well over half the population is indigenous, followed by a large percentage of mestizos (Indigenous – Spanish mixed race). By far the smallest category is made up of around 150 families of European origin, who have politically and economically controlled the country before and after formal independence. Potosí is one of Bolivia´s most indigenous areas. Over a third of the department´s population only speak native languages and almost every miner is indigenous. There were 70 million Indians in Latin America when Columbus sailed towards its shores with a dark cloud following close behind. A century and a half later, there were just 3.5 million. As has been the case in so many countries, the indigenous have long been excluded from the official nation, merely providing its labour force. But Bolivia is beginning to realise it is a country with an indigenous majority. In 2003, following a massive uprising in which the miners´ co-operatives were a vital component, Bolivia elected its first indigenous president, Evo Morales. 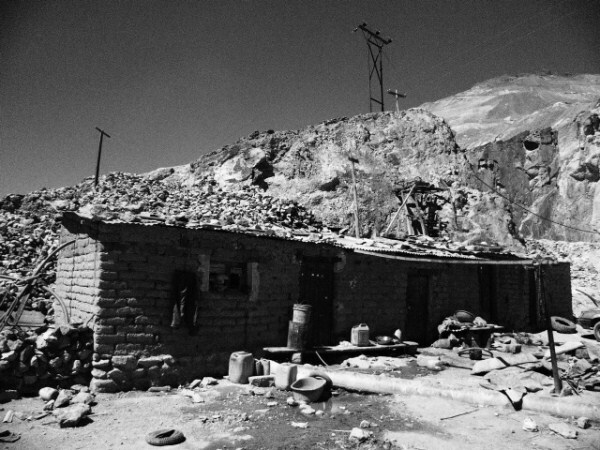 The mining of Potosí left the altiplano of Peru and Bolivia with massive indigenous depopulation, ecological degradation and the annihilation of traditional agriculture, not to mention unspeakable suffering. The discovery of that ´´inexhaustible mountain of silver´´ has made Potosí the outstanding example of the ´curse of resources´ that has defined the past 500 years of Latin American history. Those places that were rich in natural resources and, as such, had the closest links with the colonial plunderers, are now the most underdeveloped and poverty-stricken. Cerro Rico funded the development of Europe whilst causing destruction and genocide in the Andes. Sadly, colonialism never ended. It just changed shape. Today much of the world´s wealth is made through manipulation of the poor. Most of Bolivia´s valuable resources are still foreign-owned and attempts by the Bolivian government to nationalise resources or improve royalties to a level comparable to that in western countries, are met by economic punishment and international isolation, led by the US. Isidro, who at 18 years of age, has already been working in the mines for ten years and has the cough of an old man, is one of 15,000 people still working in around 500 mines on Cerro Rico. 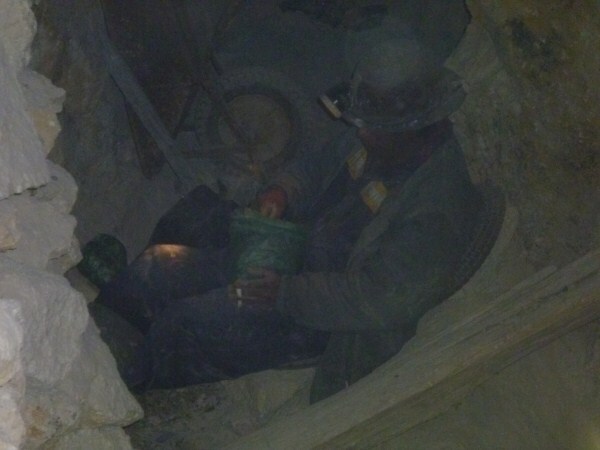 Around 800 of these miners are children, who work because mining has taken their fathers. If production is good, Isidro earns around 11USD per day. These days, 3000 tonnes of rubble is extracted for every valuable 100 tonnes. 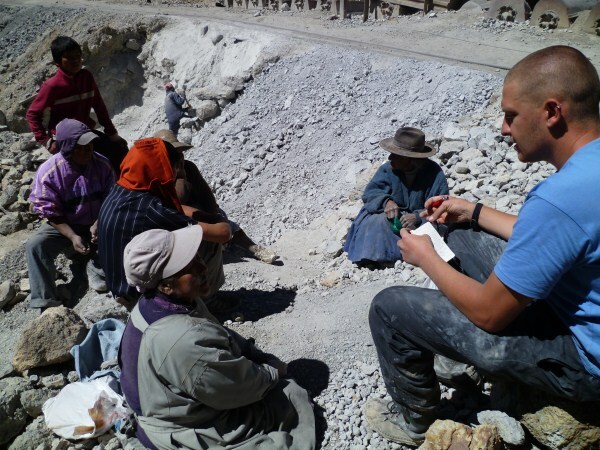 For these minerals, two men a week die of silicosis in Potosí. Others die from accidents and other mining-related illnesses, ensuring the huge miners´ cemetery is never lonely. 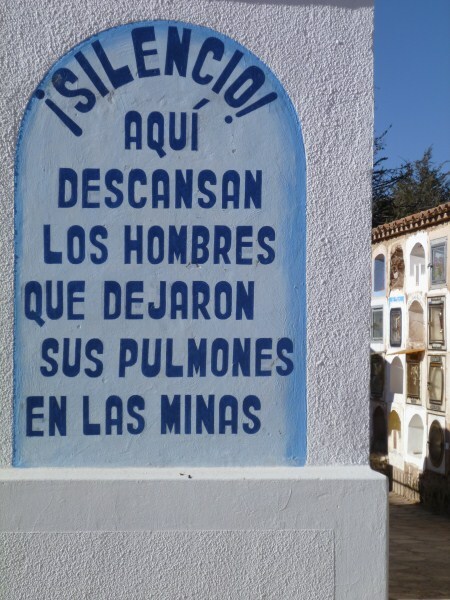 The men proudly go on as miners, even after their lives have been sacrificed for their families, with graves adorned with the elements from miners´ lives; coca leaves, cigarettes and Casa Real (a warming spirit often drunk by miners). 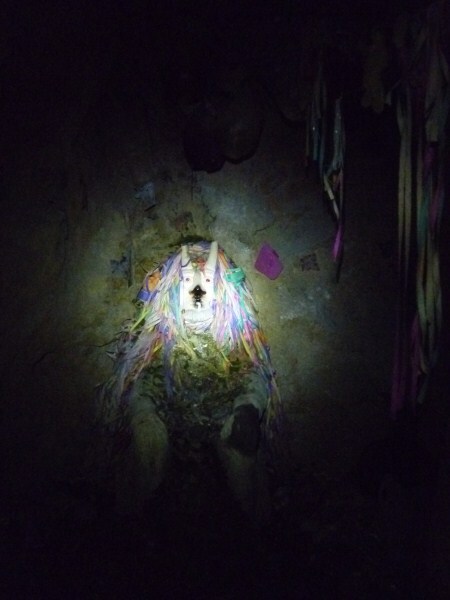 But the poorest miners of Potosí can´t even rest in peace at the end of their short lives. If a miner is not in a co-operative, his family has to pay for a burial plot on a five yearly basis. If they cannot afford the payments, the remains will be discarded and the plot used for someone else. Andres, a driller, who is caked in the dust that is killing him, tells me the mountain is still rich. Zinc, lead, tin and a little silver continue to be extracted. Though it provides the livelihood for thousands of people, and there is a subtle fear about the day Cerro Rico is finally exhausted, the mountain itself is sacred to the people of Potosí. Recent protests, in which Potosinos went on strike and blockaded their entire department for twenty days, resulted, amongst other things, in an agreement with the national government to preserve the form of Sumaj Orko, even if it means leaving some of its wealth where it is. Modesta lives in a tiny mud brick house on the side of Cerro Rico, with her husband and five of her children. She earns 45USD a month for protecting a mine entrance and mining equipment, all day, every day. Her youngest is Jose, who is only four. The odds are his father will be dead before the boy is ten, and he and his brothers will be forced to follow his fading footsteps, down the hill, into the mine, and into an early grave. House of Modesta and her family, the house is two thirds mining storage and one third house. Modesta and her children guard the mine and its equipment 24/7 and her husband works below as a second class miner. 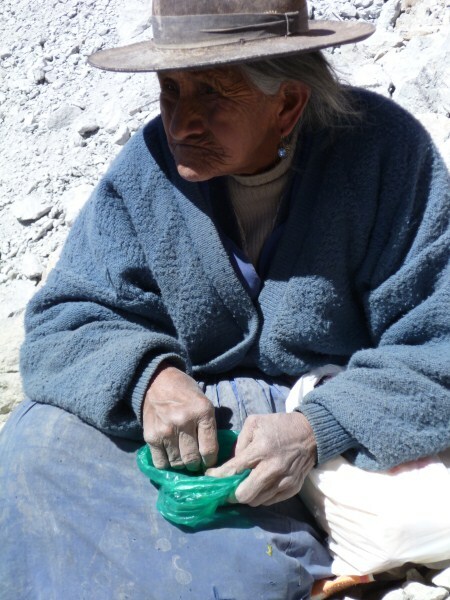 Celestina, 81 years old, takes a break to talk and have more coca leaves. Celestina works as a Palliri (someone who break rocks on the surface with a hammer to separate the different minerals). I mentioned to friend and former child miner Jorge, that the same day I worked with the third class miners, talked with an 81 year old lady and her daughter who work breaking rocks for $4 a day, and met Modesta and her children, I saw part of a program about the birthday celebrations of a 16 year old Texan girl. Her parents spent around 50,000USD on her party and another 50,000USD on a diamond encrusted mouth piece, which made her look like she had braces. I pondered to Jorge that perhaps poverty isn´t the main problem in the world, but rather, it is riches. When confronted by inequality, oppression, struggle and the horrors of humanity it is important to listen and to help others hear. Art, whether it be words, paint or the metal of Bobby-z´s sculpture, can amplify muffled voices It can force you to think about those sentenced and silenced by global politics and economics, mass media and humankind´s fortunate. The Potosís of the world should have a place in our hearts and minds, and their stories should inform and influence decisions we make. They invite us to explore what it means to be human. 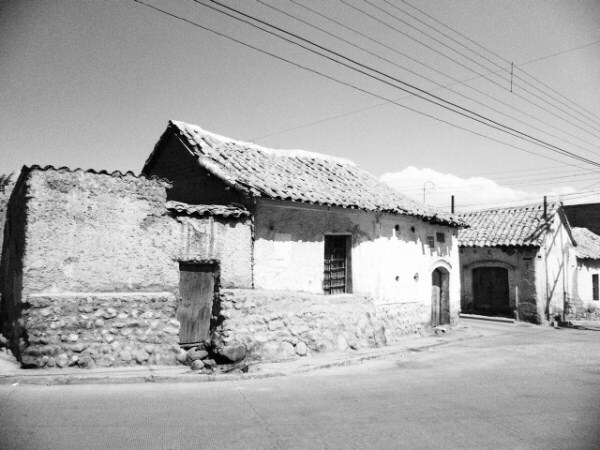 Potosí is not a regrettable memory to be recounted in history books. It is an ongoing and timeless story, of which we are all characters. The Conquistadors have now moved on, to rather leaner pastures to the West,, where there are more resources and ignorant natives to exploit, and cynical chieftains eager to sell them out.